Image caption Ahsan Hassan has been described as "callous, cold and truly selfish"
A "jealous and manipulative" man who murdered his girlfriend by suffocating her, before taking her body home in a taxi, has been jailed for life. 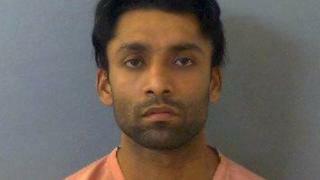 Ahsan Hassan, 28, from High Wycombe, killed 20-year-old Zofia Sadowska in a disused kebab shop in September. Reading Crown Court heard Hassan told the taxi driver she was drunk and asleep and later told police the death was part of a suicide pact. Hassan was sentenced to a minimum term of 23 years and 165 days. He "hatched a plan to kill her because he knew their relationship was going to end that night and he selfishly couldn't cope with that", Det Insp Stuart Blaik, of Thames Valley Police, said. Hassan took Ms Sadowska to the disused kebab shop on Gayhurst Road in High Wycombe at about 23:30 BST on 18 September. At about 02:00, he put her body into a taxi and they were driven to his home in Dashwood Avenue. CCTV images of Hassan carrying her "limp and motionless body" out of the kebab shop and into the taxi were shown to the jury during his trial. Police and paramedics were called to the Dashwood Avenue property just after 05:00 to reports of an attempted suicide. Hassan, who was convicted of murder last week, had tried to cover up the crime by claiming her "evilly planned" killing was part of a suicide pact, Det Insp Blaik said. Following the trial, he described Hassan as "deeply controlling, manipulative and consumed with jealousy". Ms Sadowska's death had "devastated" her family, Crown Prosecutor Matthew Knight said.